If you are looking for dependable experts in the field of Heating and Cooling systems for your home in Cedar Grove, NJ, you need not look any further than your neighbors Bloomfield Cooling, Heating & Electric, Inc., we are located in Little Falls, NJ. We have serviced many homes in Cedar Grove and the neighboring areas of Verona, Montclair and the Caldwells. We originally started in Bloomfield, NJ hence our name. As our client base grew so did we and we moved to a larger location in Little Falls, NJ. Whether you are building a new home or remodeling, Bloomfield Cooling, Heating and Electric can offer expert installation of an entirely new heating system or repair and maintain the system you already have. Bloomfield Cooling, Heating and Electric, Inc. has been in business for over 25 years. We are family owned and operated by the DeJoseph family and we service the northern, NJ area including Essex, Bergen, Passaic and Hudson counties. When you call us, you will be greeted by our professional customer service representatives. They will discuss your needs and schedule a convenient appointment for you with a Certified Technician that has the experience to provide you with a free analysis based on your HVAC needs. Whether you are looking to upgrade your current system to one that is more efficient and environmentally friendly or you are looking to have your current system repaired or maintained Bloomfield Cooling, Heating & Electric, Inc. is a full service licensed and insured company. We provide a “White Glove” customer service whenever we are invited into your home. From shoe coverings to drop cloths and removal of all debris created by our technician. We always make sure that you, the consumer, are knowledge and comfortable operating the system and know what warning signs to look for. We believe that an informed customer is a more satisfied customer – We strive to accomplish this every time we are invited into someone’s home. 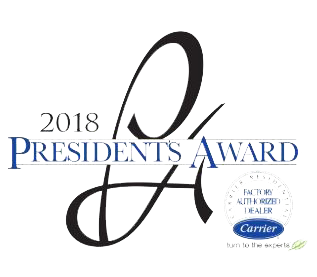 Just recently we were honored to receive the Carrier 2016 “President’s Award” and we have been recognized by Angie’s List for the last 10 years in three categories HVAC, Generators and Electrical Services and for the last 2 years in a row by Suburban Essex Magazine’s readers who have voted us the title of Best HVAC Contractor in the Best of Essex Awards. Our greatest satisfaction is knowing that our customers refer us to their family and friends and knowing they are happy with our service.